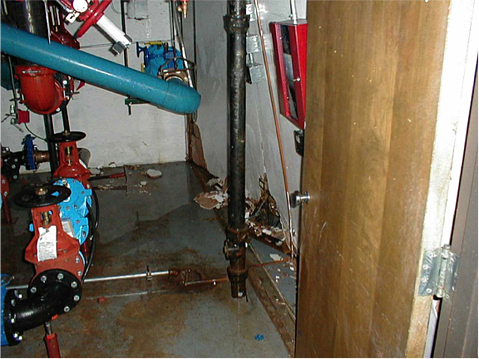 Certain backflow preventer installations should never be installed indoors. The flange-size reduced pressure zone backflow preventers, those assemblies with a pipe size of 2½” and larger, is one of them. The risk of personal and/or property damage is simply too great because a flood will happen, even with conventional drain systems in the mechanical room floor. In our last blog we discussed the various backflow preventer assembly failure scenarios and which failure combination represents the perfect storm, that single highest damage risk. Today we’re discussing the flood itself. A few years ago, Safe-T-Cover sent me on a mission to witness a failing RPZ backflow preventer. But as you might expect, such an event is difficult to capture live. All it does is react. It has no idea – or opinion about – what will happen to the surroundings after the fact. It simply reacts. So without a way to predict when an RPZ will be forced into its reactive mode, I did what any normal person would do: I called the fire department. I told them what I wanted to see and they said they would like to see it too. Delighted at the idea of creating a bonafide catastrophe, we decided to create the event ourselves at the Nashville Fire Department Training Facility. In setting up this failure, we removed the closing mechanism of the #1 check valve simulating a mechanical failure to close. Next, we jammed a small piece of solder debris into the hinge area of the relief valve where it is likely to get caught, and finally, we shut off the flow beyond the #2 check valve simulating a stop in user demand. The fire department fed the assembly a flow of water at 88 PSI, a flow rate that would be consistent with overnight flow rates in well-served cities. While we were happy with the simulation, there are a few under-reported aspects of the test that should be kept in perspective. First, this is only a 3” reduced pressure zone backflow assembly. It is important to think about how much more damage a full grown – 8” or 10” – backflow assembly would do. It’s a difference in orders of magnitude rather than degrees. Secondly, the flow rate reached only about half of what the manufacturer specified was “possible.” This is precisely because of the mere 88 lbs of flow rate. If this assembly was in the basement of a high rise, and the failure had been the #2 check valve, the initial head pressure would have caused the flow rate to be higher, much higher. On the other hand, without a constant flow from the public side, the head pressure would fall reasonably quickly and water release would eventually cease. Therefore, such an event, a failure of the #2 check valve, is not considered the worst case in terms of property damage. It is still clearly a large head volume from a large building which could be devastating and should not be underestimated. First, this is only a 3” reduced pressure zone backflow assembly. Pretty much a baby dragon. It is important to think about how much more damage a full grown – 8” or 10” – backflow assembly would do. It’s a difference in orders of magnitude rather than degrees. Second, the flow rate reached only about half what the manufacturer specified was “possible”. This is precisely because of the mere 88 lbs of flow rate. If this assembly was in the basement of a high rise, and the failure had been the #2 check valve, the initial head pressure would have caused the flow rate to be higher, much higher. On the other hand, without a constant flow from the public side, the head pressure would fall reasonably quickly and water release would eventually cease. Therefore, such an event, a failure of the #2 check valve, is not considered the worst case in terms of property damage. It is still clearly a large head volume from a large building which could be devastating and should not be underestimated. Essentially, we learned that a 3” reduced pressure zone backflow assembly can be relied upon to fill a 12 X 12 mechanical room to its ceiling in about one hour. Of course, that’s if the walls hold. Not likely. We have some rare photographs of an actual RPZ event. I say rare, because such pictures almost never reach the public domain. Virtually NO ONE wants such pictures to surface. Not the property owner, not the manufacturer, certainly not the designers or installers, and most troubling, not the water authority and building authority due to the perceived violation of the public trust. 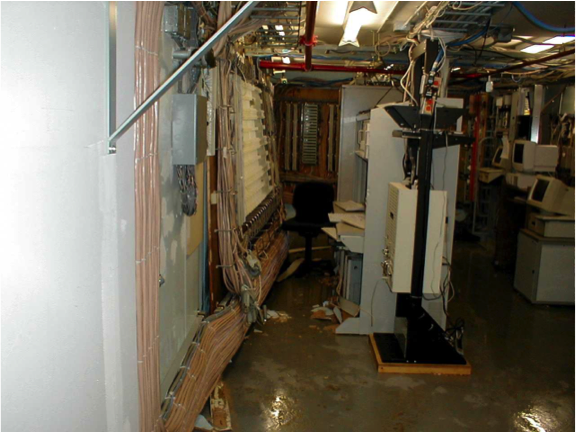 This mechanical room flood caused just over $1M of damage. This first image shows this Wilkins 375 4” RPZ valve in a typical mechanical room setup. Note the 4” floor-drain to the right. One day (or more likely, one evening) this Wilkins 375 commenced to behaving in a manner consistent with its design. It began dumping huge volumes of water. The sudden water flow and volume moved the wall (behind the door) off of its stud and into the next room, which happened to be a telephone and low-voltage wiring room. This room is the second image. Through the legal magic of something called the subrogation clause, the casualty insurance carrier sought recovery from all the usual suspects including the engineer, architect, contractor, subcontractor, and even the most recent backflow preventer tester. Ironically, only the tester was fully exonerated. He showed his annual test record, a test that had been completed some three months prior, indicating proper working order. This reveals a fundamental misunderstanding of what these systems are designed to do. There is a false assumption that floods only occur when the backflow preventer fails to perform as designed. Sadly, the best way to ensure an indoor flood when that perfect storm occurs is to maintain the assembly properly. Let me say it another way. Just as Dragons start fires when they cough, RPZs are designed to perform a catastrophic release of water when their check valves fail or are blocked. It’s what they do. While the details of who paid what were not made public, we do know that the property insurer was made whole by one or more of the listed defendants. So if these things are designed to dump water, and you are determined to place it inside a building in a mechanical room, then drain capacity is the issue. Right? 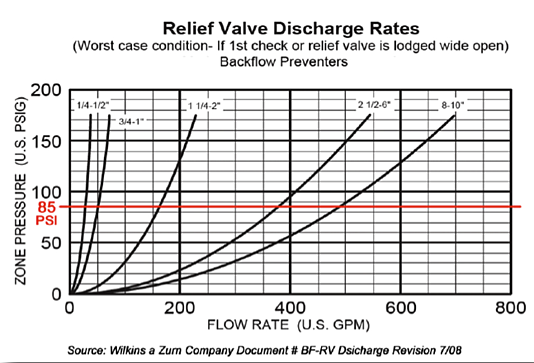 The graph shows the manufacturer-provided Relief Valve Discharge Rate chart for the aforementioned Wilkins 375. It shows what that assembly will release in the perfect storm at various pipe sizes and at various pressures. I’ve picked out a rational overnight pressure of 85 PSI and drawn a red line. Given the fact that we are considering a 4-inch assembly, we focus on the curve labeled “2½ - 6 inch”. That assembly and pressure combination will dump approximately 375 gallons per minute. “But wait,” you say, “We have a drain!” Yes. Let's factor in the drain. According to EngineeringToolbox.com, a 4-inch drain system installed with a 1% grade of decent will clear as much as 93 gallons of clean water per minute. So if we are dumping at 375 GPM and we are draining at 93 GPM, then we’re flooding at a rate of 282 GPM! That’s about 100 gallons more than the 3” assembly in the video. Remember when I said the pipe sizes represented an order of magnitude increase rather than mere degrees? Rough calculations infer that if this mechanical room is of comparable size, then it would have filled to the ceiling in about 38 minutes had the walls held. Plumbing engineers can design elaborate and expensive 8-inch drain systems all the way to the sewer, or put RPZs outside. The safest place for your backflow preventer installation is in an above-ground enclosure that is outside. Our guide “Trends in Backflow Preventer Installation” can show you some of the more common installation locations and the risks you take when you install a backflow preventer inside.